Well, we are more than a week into the New Year. Many have made some type of resolution, most likely regarding self-improvement. According to a 2015 Nielsen poll, health and wellness are the typical top priorities for U.S. consumers. “Staying fit and healthy” came in at 37%, with “lose weight” coming in a close second at 32%. Enjoying life, getting fiscally fit and spending more time with family and friends rounded out the top five. While some report that only about 41% of people even make resolutions, nearly 80% of them will fail in maintaining their resolutions by the second week of February. Interestingly among the top ten resolutions, there is nothing overtly spiritual about them. As the Apostle Paul addressed his son in the faith, Timothy, he encouraged, “On the other hand, discipline yourself for the purpose of godliness; for bodily discipline is only of little profit, but godliness is profitable for all things, since it holds promise for the present life and also for the life to come” (1 Timothy 4:7-8, LB). If you are one who makes resolutions, do you focus only on the present life value of a resolution or do you think of the eternal life consequences, too. If you’re goal is to live a healthy and long life, what will be the eternal payoff for living longer here? Will you be spending that life building heavenly treasure or earthly treasure that will burn up? If your focus is on financial goals, are they focused on your own security or to benefit others and investing in ministries that will help people grow in their pursuit of God, as well? It is easy to be temporal in our goals and resolutions. However, I was reminded of the long view as I reread a devotional passage last week. 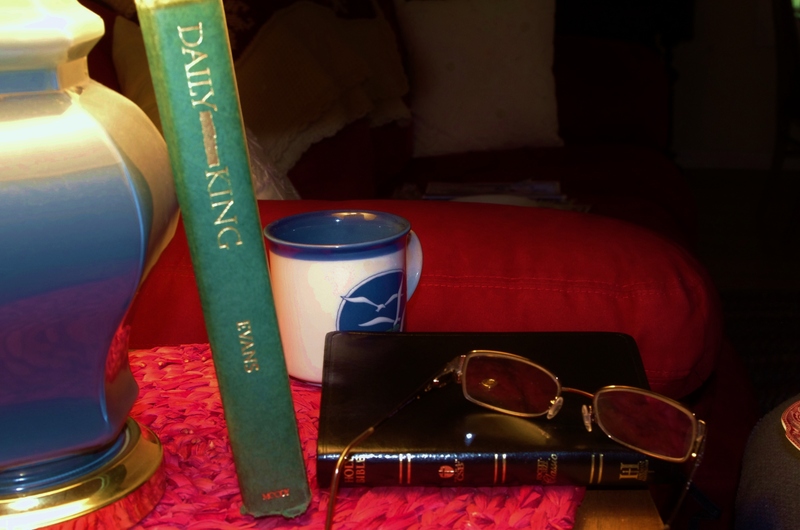 Over the years, I have used W Glyn Evans’ book, Daily with the King, as a daily prompt to prayer with my wife. The January 5th devotion was especially appropriate as one sets the course for his year, his life, and his eternal life, for that matter. Here are the points of his writings for that day (with the exception of the last two, scriptures are my addition). May God prosper you in your commitments this year, giving you perseverance to follow-through with the physical, intellectual, emotional, relational, financial and, most importantly, spiritual disciplines that will payoff in eternally rewarding ways. What steps do you need to take to center your life on God’s will? Do you agree that peace, power, success and fruit are by-products of a relationship with God and not things for which to pray? Are you seeking for “ends” or satisfied with being in the “process” of continually knowing God? Where is self reigning in your life rather that God ruling? Weekly Photo Challenge: Good Morning! Just for fun, here is another “Good Morning” picture to amend a comment I made about Vladimir Brezina’s post Travel Theme: Relaxing. His first photo showed Johna having a cup of coffee on a sandbar. 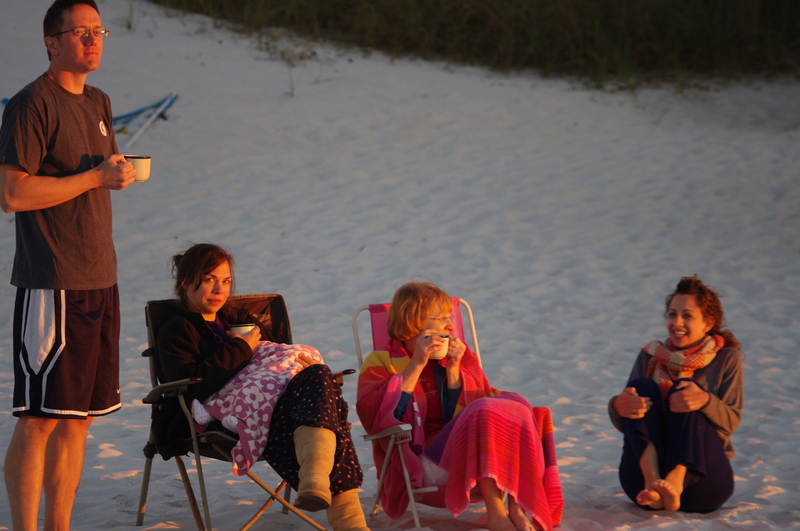 Occasionally, a few brave souls join us for sunrise on the beach during our vacation time. Since the end of October is a little chilly even on the Gulf Coast, daughter #2 has her feet raised off the cold sand. Daughter #1, holding sleeping baby, gives me the “don’t you dare take this picture” glare! Oh, well…there it is. For more examples of “Good Morning!”, go to WordPress Weekly Photo Challenge. Welcome back great blue heron... back with Spring!